Sign up for a new club or upgrade a current club to get a FREE Swarovski Crystal Bonus with your first shipment! 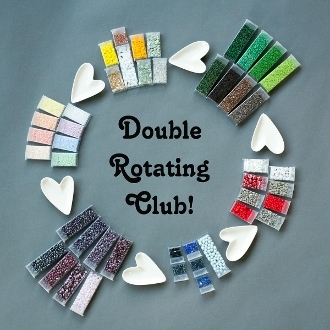 With the Double Rotating Beads of the Month™ Club, each month you will receive a double set of one of our monthly clubs (currently 11/0 Delicas, 11/0 Seed Beads, Superduos, Swarovski Crystals, 2-Hole Beads, Hot & Trendy, and the Firepolished Club). You will receive a different club each month and will rotate through all of our current clubs. You will be charged an average price based on the active clubs (currently $39.95/month). New clubs will be added to the rotating club as they are added to our site, and the price will be adjusted accordingly (you will be given advanced notice of any price changes). With your Double Rotating Beads of the Month™ Club you will also receive a code every month that provides you access to our FREE pattern page! Codes are valid until the last day of each month, then new codes are sent out with the next shipment for the next month's FREE patterns. By ordering this product, you are authorizing Beads of the Month Clubs to charge this amount, plus shipping, to your credit card or debit card each month until you cancel. *Plastic storage boxes sold separately. PLEASE READ: If you choose to sign up for both the Rotating Club and any other Club (or Clubs), GREAT! We just want you to be aware that whenever the other Club(s) you order come up in the Rotation, you will get doubles of the same beads. For example: Someone signs up for the Single 11/0 Delicas and the Double Rotating Club. In January they receive a Single 11/0 Delicas and a Double Hot & Trendy. Then in February, they receive a Single 11/0 Delicas and a Double OF THE SAME 11/0 Delicas. Then in March, they receive a Single 11/0 Delicas and a Double Superduos. And their shipments continue on in such a manner. We just want to make this clear so that you know exactly what you are signing up for and there are no unpleasant suprises! Have questions? Visit the page below to view our FAQ page! We stand behind our guarantee that you'll love your beads. We’re so committed to making sure you are satisfied that we have a 100% money-back guarantee. If you are not completely happy with your club, send it back to us with the original invoice and we will fully refund your money (less shipping costs). Please note: for returns for the Rotating Clubs you will be refunded the price of the specific Club you return. Copyright © 2014-2019 Adornable Elements. All rights reserved. Photos by Kimberli Ransom Photography, all rights reserved.